Atlantic South Region: Cherokee County Senior Olympics comes to Lake Arrowhead, GA.
Cherokee County Senior Olympics comes to Lake Arrowhead, GA.
On April 20, 2012, Pickleball became the first Senior Olympic event to be held in Lake Arrowhead. Twenty three senior players from north Georgia braved a wet morning to play in this event held on the new Pickleball courts at the Red Cloud Sports Complex. Competition was held in beginner, intermediate, and advanced divisions. A round robin changing partner every game format was used. Division champions were: Beginners: Jim Bennet, Intermediate: William Criswell, Advanced: Dr. Tom Earley. Front row: Bill Hess, Carole Hess, Ann Earley, Judy Vonesh, Jill Conner, Pat Dunn, Tom Earley, and Wayne Page. 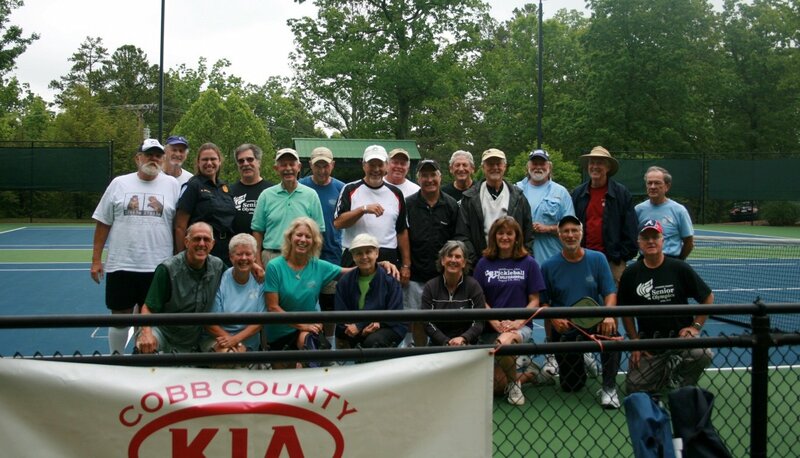 North GA Pickleball Club player Ann Earley adds: "This was the first time a tournament was held at the Lake Arrowhead Pickleball and Tennis Courts. Despite the morning rain, I think it was a success.... Special thanks to tournament organizers, Bill & Carole Hess who did the lion’s share of the work."